After Skylar Spence exited the stage, Sango spent the first ten minutes of his set dealing with several tech issues. Once things finally got up and running, a flurry of balmy trap beats hit the air and began to heat up the crowd. 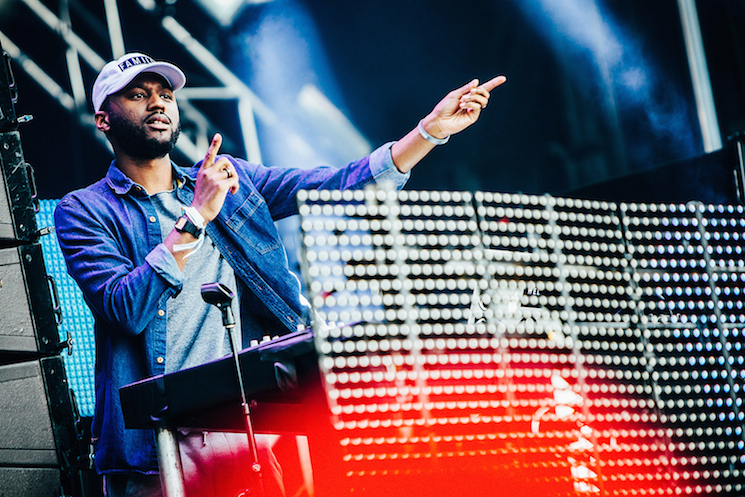 After dropping several of his Kaytranada collaborations throughout the set, a misty overdub of Drake's infamous "Running through the six with my woes" line looped into a new Sango track, a glossy, bass heavy production where rumbling break-beats grew more and more distorted with every tremendous drop. With the exception of a very smooth edit of Aaliyah's "Are You That Somebody" and a jazz-infused mix of Kanye's "All Day" laced in snippets of Justin Timberlake's "Cry Me A River," Sango's set slowly became pretty boring, with selections that either hit the mark or just didn't hit at all. The crowd remained responsive, but it became pretty difficult to gauge whether or not they still felt the vibe by the time his set had come to an end.